(Phys.org) —Two teams of researchers, one working in Saudi Arabia, the other in Spain, have discovered independently that adding vibrations to a graphene surface allows for more efficient conversion of photons to plasmons. In their papers, both published in the journal Physical Review Letters, each team describes how they found that causing a two-dimensional graphene surface to vibrate (using two different methods) led to a huge increase in light energy being coupled. It's very common and relatively easy to use light or electronics as a means of carrying data—what's difficult is using both in the same device. The problem is getting photons converted to electrons and vice-versa. Recent research has found that using two dimensional graphene as a means for doing so might be feasible, but up until now, scientists have only been able to achieve efficiencies of approximately 2 percent. In this new effort, both teams were able to increase the efficiency to 50 percent by causing the graphene surface to vibrate in a tunable way as it was being hit with light. 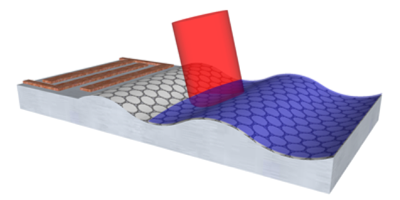 To reduce scattering, both teams applied a vibrating force to the graphene sheet. The Saudi team attached an actuator—the Spanish team added piezoelectric material as a base to the graphene. Both resulted in the same outcome, namely, causing the electrons in the surface of the graphene to vibrate as they were being struck by photons—tuning the vibrations allowed for rousing the conduction electrons into plasmons, which thereafter could be processed by electronic components. The results by both teams are just the first step in creating mechanisms that are able to join electronic functions with photons which may one day lead to devices such as exotic super-sensitive chemical detectors, new kinds of photovoltaic cells or general purpose nano-optoelectronics devices.